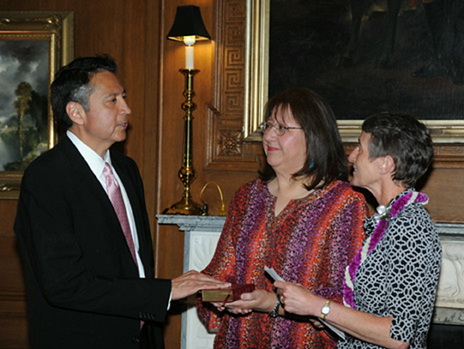 Vincent Logan was sworn into office as the next Special Trustee for American Indians on July 7, in Washington, D.C.
Sally Jewell, Secretary of the U.S. Department of Interior, swore in Logan in her office. 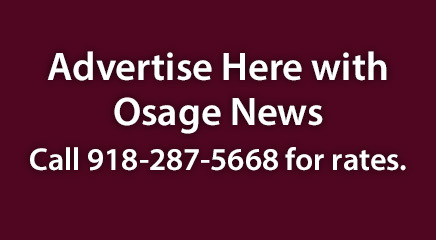 Holding the bible for him was his sister, Jeanine Logan, former Osage Nation Supreme Court Chief Justice and Supervisory Senior Attorney for the Social Security Administration in Norman. Osages attending his swearing in included Principal Chief Geoffrey Standing Bear, former principal chief Jim Gray and Kristen Pratt, who works for the National Congress of American Indians and is related to Logan. Confirmed on June 26, 2014 by members of the U.S. Senate, he will oversee the management of more than $4.6 billion in American Indian trust funds. Logan is the fourth person to hold this position since OST was established in 1994 and the second Native American. According to a prepared release, Logan brings considerable investment knowledge to the position. As the President of The Nations Group, LLC, he worked with tribal clients, varying from small accounts to large tribal reserve funds. He helped tribal leaders draft investment guidelines, select asset managers, and collateralize tribal funds for casino expansion projects. Logan is committed to investment education for tribal individuals and youth. He developed a training program, Your First Paycheck, based on his experience growing up in Oklahoma and receiving his first paycheck through the Comprehensive Employment and Training Act program. He knows that a lack of investment knowledge limits a community’s capacity for sustained growth and development, according to a prepared release. A graduate of Oklahoma State University and the University of Oklahoma, College of Law, Logan worked in New York for Schulte Roth & Zabel, a pre-eminent investment management law firm. He moved to a position with the Merrill Lynch Private Banking and Investment Group, where he received training and licensing in the securities industry. The Indian trust consists of 55 million surface acres and 57 million acres of subsurface minerals estates held in trust by the United States for Native Americans, Indian tribes and Alaska Natives. More than 11 million acres belong to individual Indians and nearly 44 million acres are held in trust for Indian tribes. On these lands, the DOI manages more than 119,000 leases. For fiscal year 2013, funds from leases, use permits, settlements and judgments, land sales, and income from financial assets, totaling approximately $791 million, were collected for about 393,000 open Individual Indian Money accounts. About $642 million was collected in fiscal year 2013 for about 3,000 tribal accounts (for over 250 tribes), according to the release.